High-cost marketing practice done by credit card companies to provide excessive economic benefits to major franchises and major corporates will be improved. Chairman Choi Jong-gu of Financial Services Commission (FSC) held a meeting with Chairman of The Credit Finance Association and presidents of credit card companies and announced FSC’s plan to improve competitive edge of credit card industry and high-cost management structure. This is a follow-up measure to South Korean Government’s plan to restructure credit card transaction fee system. FSC managed a ‘task force’ with Financial Supervisory Service (FSS), The Credit Finance Association, and Korea Institute of Finance (KIF) and discussed about various measures to improve competitive edge of credit card industry and high-cost marketing practice based on suggestions from credit card industry. First, financial authorities decided to limit economic benefits provided to major corporate members and major franchises. Their intention is to improve integrity of credit card companies by improving excessive marketing spending practice. They decided to apply various limitations such as establishment of certain standard for economic benefits and others to enforcement ordinance of Specialized Credit Financial Business Act. This will help eliminate any unreasonable practice done by credit card companies to attract corporate members. FSC is planning to punish any business that requests or provides economic benefits that surpass a permissible range. FSC also decided to prohibit any unfair compensation in a form of cash to major franchises. Credit card companies spent $5.87 billion (6.7 trillion KRW) in marketing cost in 2018. Amount of marketing costs had increased by more than 10% every year and excessive marketing costs have been causes of increased credit card transaction fees. FSC is also going to tighten up its screening on profitability of credit cards. To diversify sources of profits for credit card industry, financial authorities decided to support credit card companies with data-related businesses so that credit card companies can create added values based on information that they already have in possession. FSC decided to revise enforcement ordinance of Specialized Credit Financial Business Act to allow cross-ownership of MyData industry and individual business credit evaluation industry and open Big Data provision service. 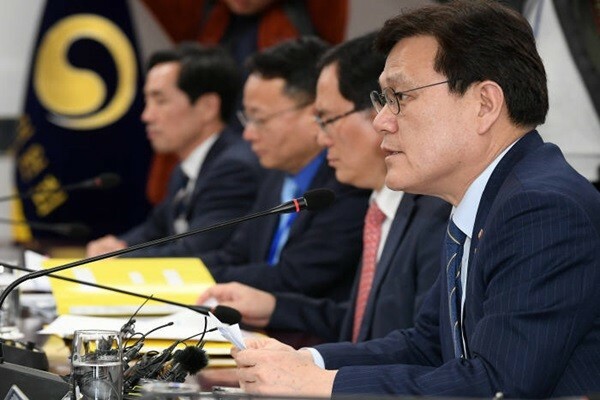 However, major demands by credit card companies and labor unions of credit card companies were not included into follow-up measures of South Korean Government’s plan to reduce credit card transaction fees. Labor union committee that is comprised of labor unions of 6 credit card companies demanded immediate adoption of differential fee system and lower guide system.